Well, I’m finally able to post the Calgary cityscape painting I’ve been hammering down on for the last couple of months! It’s been safely delivered into the hands of its new owners on a beautiful sunny Calgary afternoon! It made for a really unique story as a surprise anniversary gift that I’ll tell you about it a little later once I post some additional photos. At 5 feet long by 2 feet high this painting was probably the most technically challenging piece I’ve ever produced. With Mitch’s perfect planning, he was he able to keep it a secret that the painting was being produced as a surprise to his wife Taryn for their 10th anniversary. 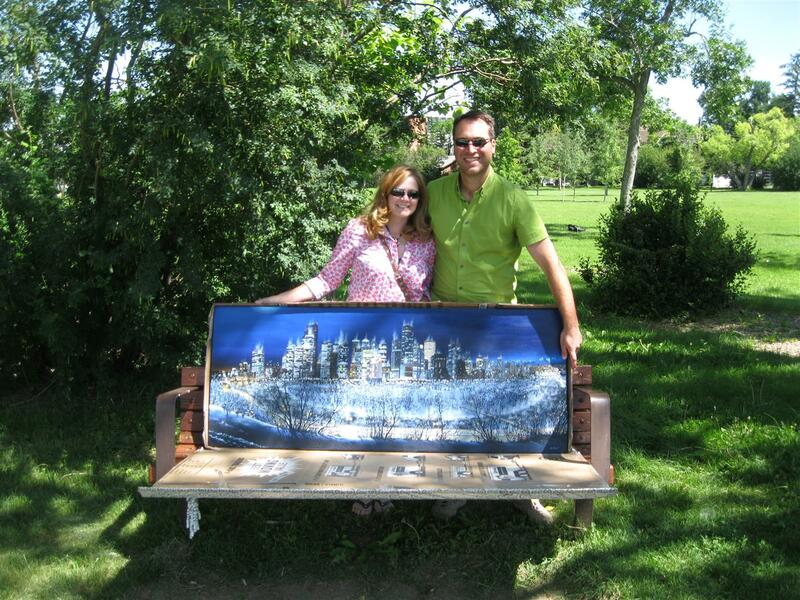 Last minute communications allowed me to set up the painting on the park bench in Crescent Heights overlooking downtown Calgary, where Mitch had originally proposed to Taryn. Low and behold, when they were taking a stroll, whaddya know? A package with her name written on it was leaning on the bench! She was very surprised, and I’m pleased to announce they both loved the piece. It was designed to look like the cold November night they remembered.